© Richard PechnerThe latest deep dive into The Grateful Dead‘s archives will be a 19-disc box set titled Pacific Northwest ’73-’74: The Complete Recordings, featuring six previously unreleased full concerts that band played in Seattle; Portland, Oregon; and Vancouver, Canada. The collection will be released on September 7. 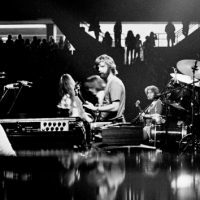 The concerts featured in the box set took place on June 22, 1973, at P.N.E. Coliseum in Vancouver; June 24, 1973, at Portland Memorial Coliseum; June 26, 1973, at the Seattle Center Arena; May 17, 1974, at P.N.E. Coliseum; May 19, 1974, at Portland Memorial Coliseum; and May 21, 1974, at the University of Washington’s Hec Edmundson Pavilion in Seattle. Pacific Northwest ’73-’74: The Complete Recordings will be packaged in an ornate box and will come with a 64-page book featuring an essay by Grateful Dead expert Nicholas G. Meriwether and photos by Richie Pechner. The box set also will be available for purchase in two high-quality digital audio formats. In addition, a compilation called Pacific Northwest ’73-’74: Believe It If You Need It, featuring highlights from the box set, will be released the same day as a three-CD set, digitally and via streaming services. Also, a limited-edition six-LP 180-gram vinyl set featuring the full Portland Memorial Coliseum show from May ’74 will hit stores on September 7.